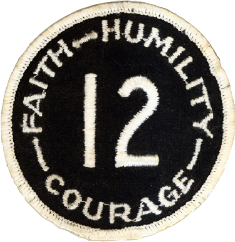 In a pre-game ceremony before the first Joe Roth Memorial Game against USC on October 29, 1977, Joe Roth's #12 jersey was officially retired. The ceremony marked the first and only time in the University of California's football history that a player's jersey had been retired. Dave Maggard, the Cal Athletic Director, was joined by Joe's brothers John and Tom for the brief ceremony that took place on the field. As a tribute to Joe was being read over the stadium public address system, Dave Maggard ceremoniously handed John and Tom one of Joe's jersey. This moment is captured in the photo below. Joe's parents, Lawrence and Lena, decided not to attend the game out of concern that the event would be too emotional. Roth's #12 jersey is permanently on display in the Cal Hall of Fame room. A permanent reminder of Joe's retired #12 jersey now exists in Memorial Stadium. 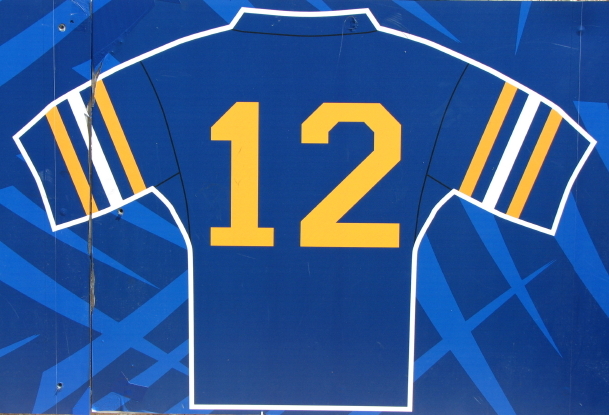 A replica of Joe's uniform has been adhered to the stadium wall behind the team bench near section T. Below is a picture of the Joe Roth jersey on the stadium wall. Thirty six years after throwing his last pass for Granite Hills, Joe Roth's #12 high school football jersey was retired. On October 17, 2008, during a halftime ceremony of the Granite Hills vs. Mount Miguel football game, Granite Hill High honored three of its former football greats by retiring the jerseys of Brian Giles, Tommy Vardell, and Joe Roth. 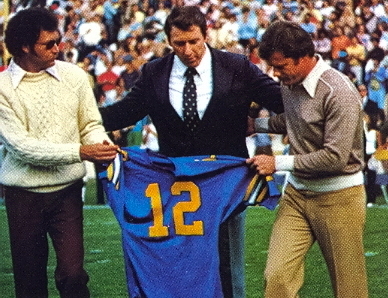 The event marked the second #12 Joe Roth football jersey to be retired. Roth was a three-sport letterman at Granite Hills, where he established records in football, basketball, and baseball. As a senior, Roth earned All-Grossmont League first team quarterback honors by completing 78 of 143 passes (54.5%) for 1,104 yards, eight touchdowns, and six interceptions. Roth finished his Eagles varsity basketball career as the seventh all-time rebounder (357 rebounds) and the number eight all-time scorer (451 points). He also earned first team All-San Diego County Baseball honors by hitting .447 and playing great defense as a first baseman in his senior year. Three members of the Roth family attended the game and participated in the ceremony. Pictured below are Joe's nephew, Jake Roth, and his nieces Abbey (Roth) Daniels and Ashley Roth.